Royal Mansour Marrakesh: world’s most luxurious hotel! 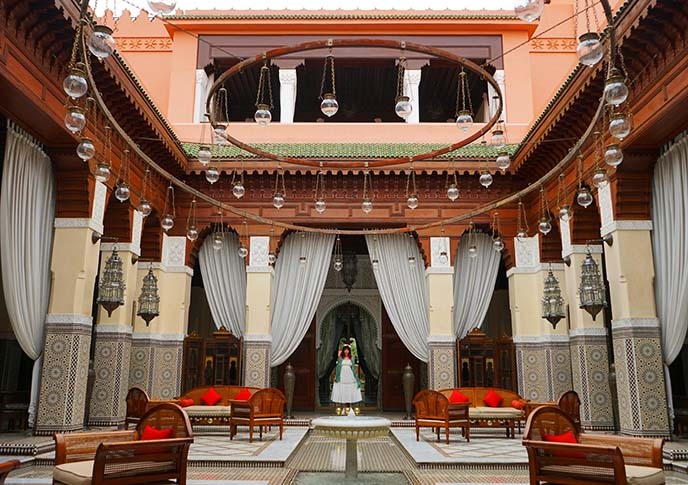 5-star Morocco riad, Michelin restaurant. Come aboard my magic carpet, and fly with me through a Moroccan fantasy hotel: Royal Mansour Marrakesh! 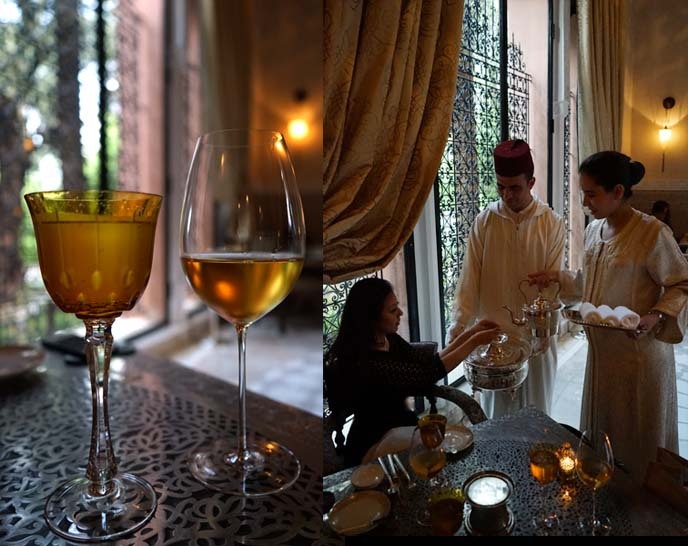 My film team and I have been invited to stay at many wonderful places, but Royal Mansour was unlike anything we’d experienced. If you’re a dreamer like I am, inspired by the art and culture of Morocco, then you’ll understand why this five-star riad is so special. 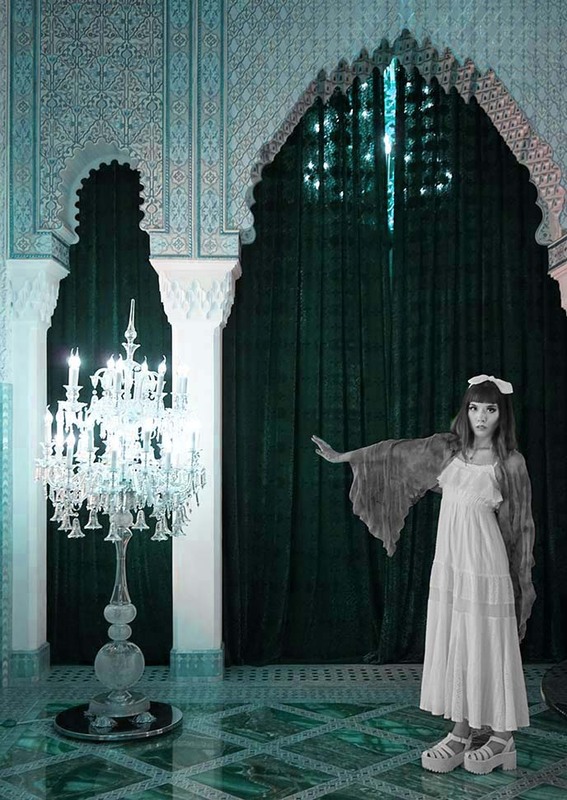 My friends and I felt like Scheherazade, wandering the king’s palace in a daze. In a single picture, you’ll find a million details: the tiles, marble, gold, and carved arches. You can imagine the fun we had, exploring the riads and hidden lounges, and taking photos along the way. Each area was lit to perfection — such as this reception area with a glowing chandelier. 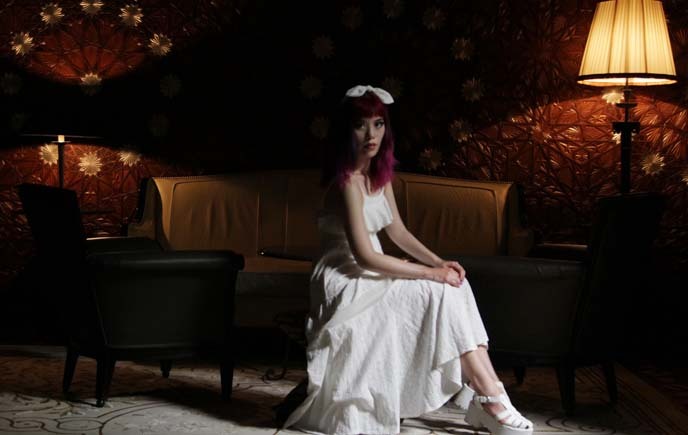 The space made me feel like Alice in Wonderland, so I wore a romantic white dress by Liz Lisa (I’m currently selling it on my Depop, in case you would like it!). I played around with some color edits, to emphasize details of the architecture. Let’s start from the entrance. Marrakesh’s Royal Mansour is only minutes from the bustling Square of the Dead, but the atmosphere couldn’t have been a bigger contrast. We drove through peaceful, opulent gardens and arches until we reached the grand entrance. An adorable “lobby girl” greeted us, wearing a red cap, military-style outfit and white gloves. At Royal Mansour, guests don’t stay in rooms. They get their very own three-storey riad, or Moroccan house with an open courtyard. My jaw dropped when I realized I had one of the 53 private riads all to myself. I stepped past a blue-tiled foutain, into a living room furnished with the finest furniture. The riad was fit for a Moroccan princess: a kitchen, rooftop terrace with a swimming pool, and my own elevator. Every detail, from the antique star lamps to the cushions with glass beads, was exquisite. My bedroom looked like an illustration from a centuries-old storybook — yet it had all the latest amenities including free movies. I spent an hour soaking in the giant marble tub that lies behind these curved wooden doors. Outside, the gardens were blooming with palms, purple bougainvillea and pomegranate trees. The landscape artist – Spain’s Luis Vallejo – also designed the gardens at the Alhambra palace in Granada (which we visited). My long white dress added to the dreamlike feeling of the space. 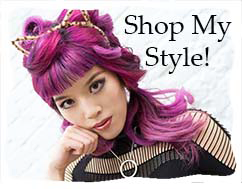 My platform sandals are these ones by YRU. The heart of the hotel is its main courtyard, a palatial arrangement around a cross-shaped fountain. 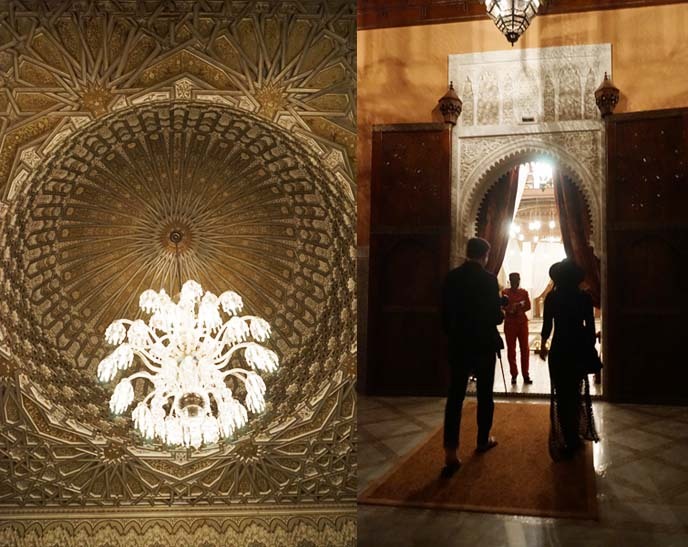 Mohammed VI began building Royal Mansour in the 2000s, and brought in the “crème de la crème” including architecture firm OBM and the French interior designers 3BIS. He spared no expense. The total budget of the project has never been revealed. He wanted Royal Mansour to be a tribute to traditional Moroccan craftsmanship — so he hired over a thousand of the country’s best artisans. Each tile was handcut and placed, and every screen was painstakingly carved. Around the courtyard, there were intimate curtained rooms filled with cushions and paintings. I ducked into this hidden space and closed my eyes, taking in the scent of jasmine and orange blossom. I listened to birds singing from the room next door, water trickling through the courtyard, and the light strains of Berber music. Every corner of the hotel delighted our senses, particularly the open-air courtyards. We walked up the stairwell and found libraries, cigar and cocktail lounges. Royal Mansour is opulence in its subtlest form. 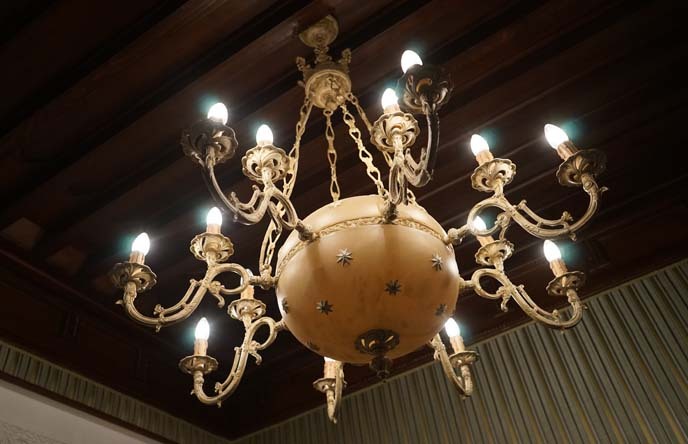 The hotel never feels over-the-top, and yet each detail is pure luxury. 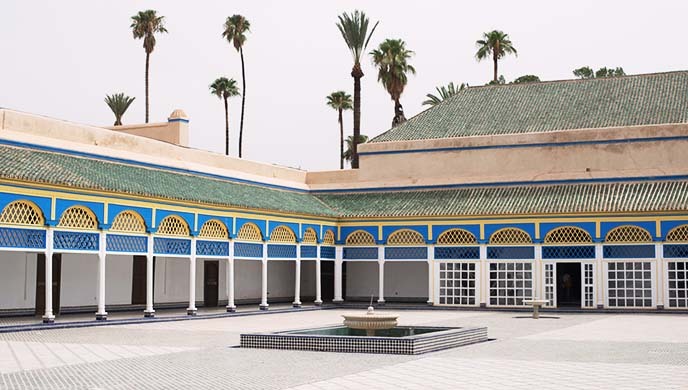 The King brought together the highest achievements of Moroccan culture in a single place: interior design, paintings, sculpture, gardens, food. The cigar room was a perfect example of the hotel’s understated luxury. At first glance, it seems like an old-fashioned gentleman’s lounge. 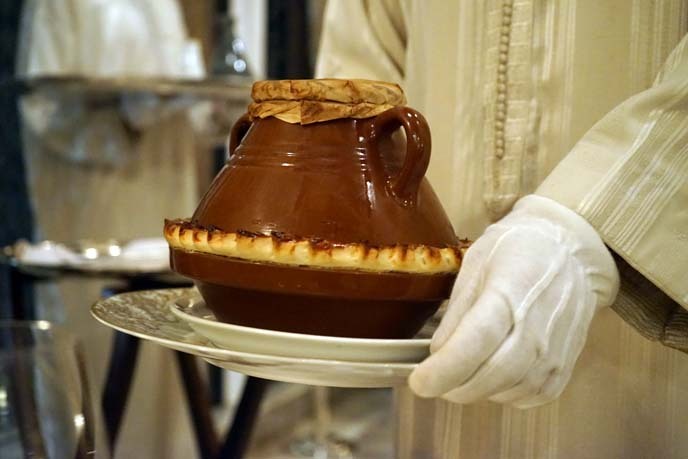 We had the dinner of dreams at one of Royal Mansour’s restaurants, La Grande Table Marocaine. It’s overseen by Yannick Alléno, a chef with three Michelin stars. Seamless service, by servers in white gloves. They poured water over our hands as a washing ritual, and served us fine Moroccan wines — above was one of the best glasses I’ve ever had. 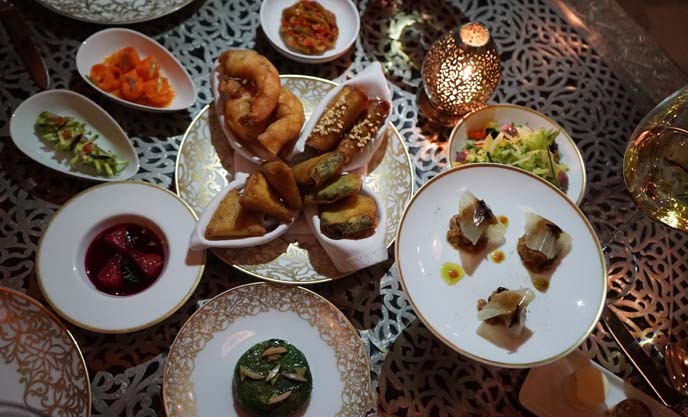 We started with our new favorite appetizer, a spread of Moroccan salads with honey and spices. In the center, we had a selection of pastillas, or savory pies wrapped in crisp pastry. I’m still dreaming of the spinach and cheese one. We loved the desserts with a molecular twist, including an orange blossom concoction with citrus caviar that burst in your mouth. 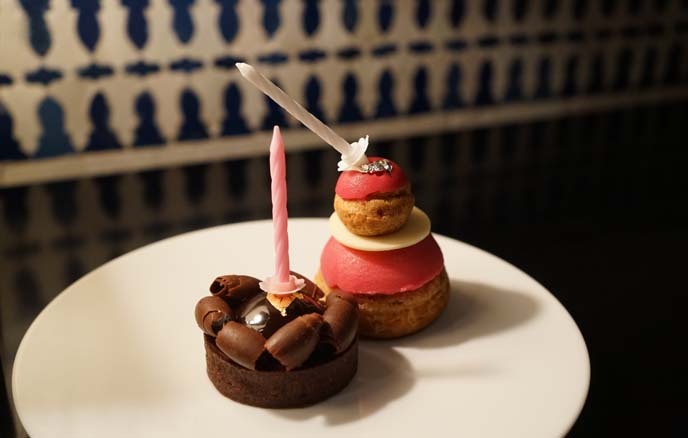 It was around my birthday… and the staff surprised me with these Grand Budapest-worthy cakes. The hotel has a clever underground tunnel system that lets staff enter and exit the riad without disturbing your peace. One of them delivered these delights at the exact right moment, and then scurried back into the tunnel like a genie. Amazing. 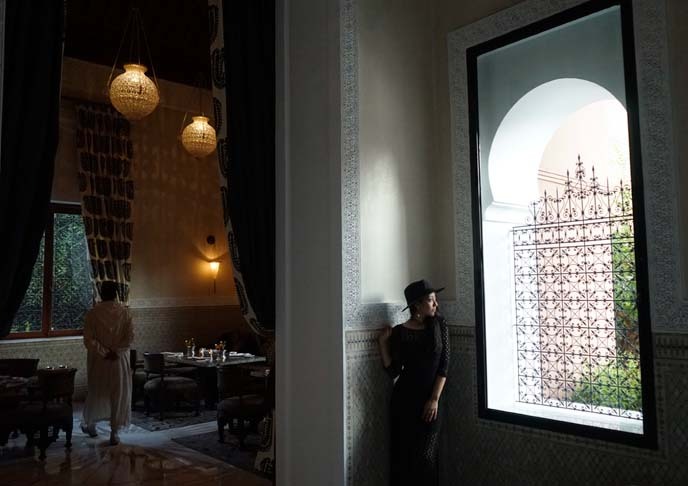 I hope the doors to your imagination are open, after this peek inside Royal Mansour Marrakesh — which deserves its title as one of the leading hotels of the world. 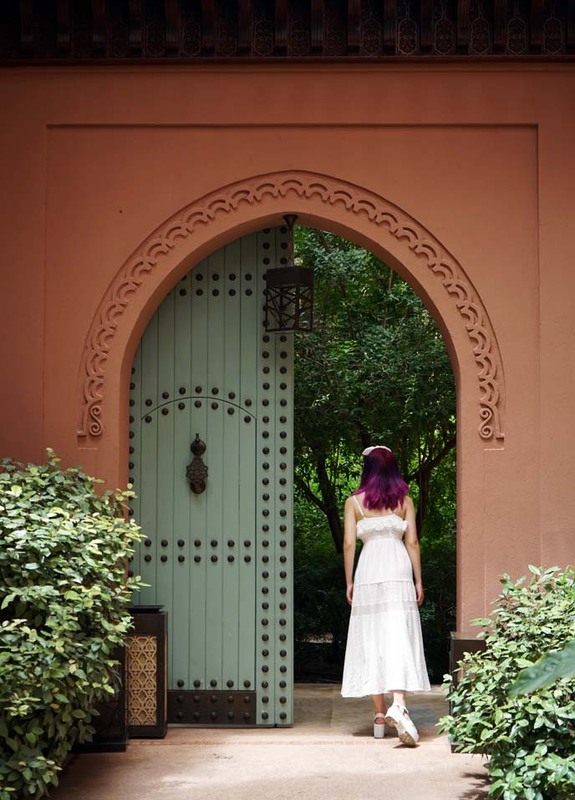 The riad just re-opened after a summer renovation, and the gardens have become more enchanting than ever. Learn more and book this hotel here. 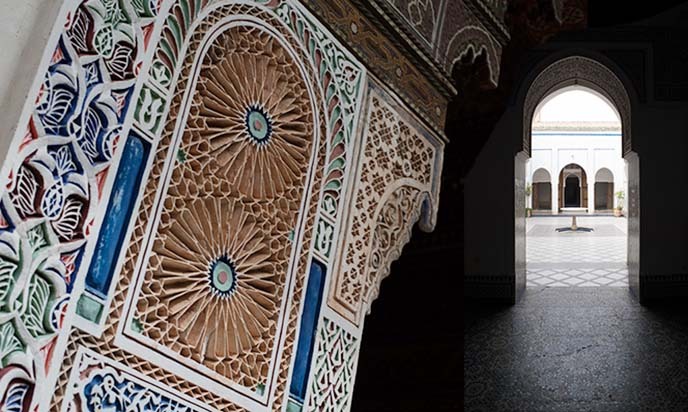 I leave you with a few shots by Joey Wong of Bahia Palace in Marrakesh, built in the late 19th century by a former slave who rose to become the Sultan’s Grand Vizier. Bahia has a 2 acre garden and harem, decorated with these intricate Islamic reliefs. 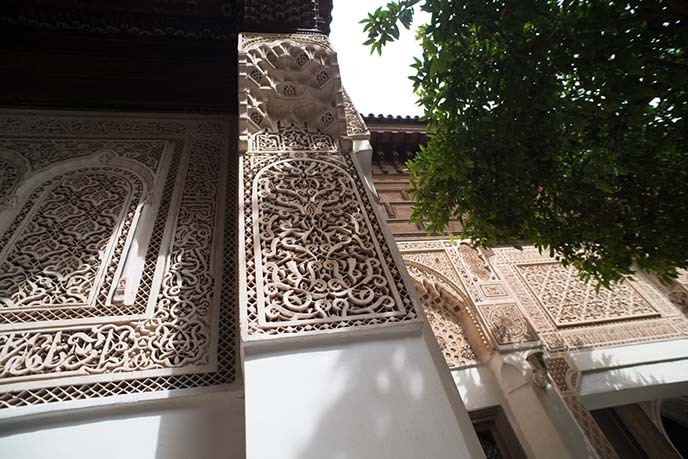 The detailing live up to the palace’s name, which means “brilliance.” Isn’t Moroccan architecture magnificent? I’d jump at the chance to come back and see more of the country. 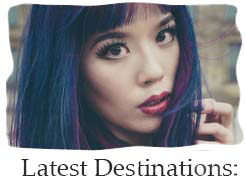 If you’re planning a trip to Fez, Marrakesh and surrounding cities, check out all my travel tips and articles here. 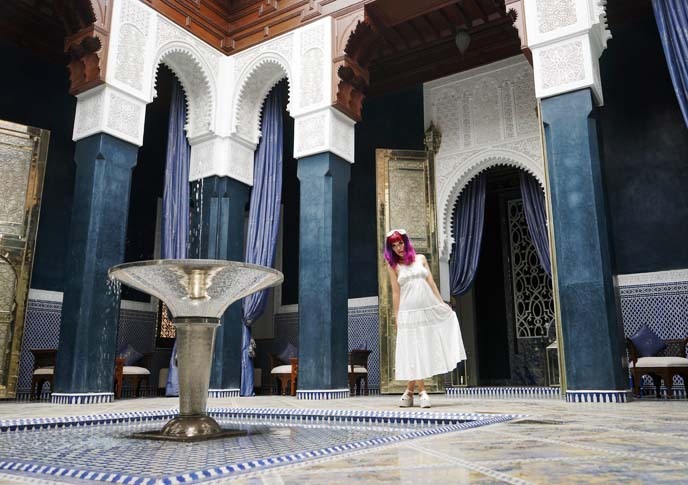 And watch me explore more of Royal Mansour in our Morocco travel video. 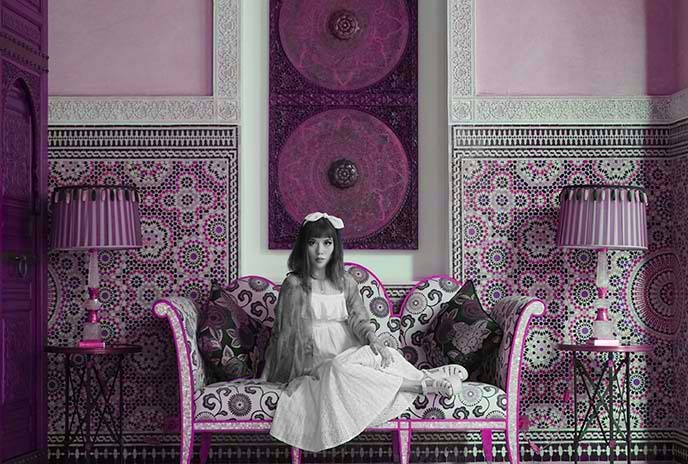 To book a stay at my riad and see prices, click here. 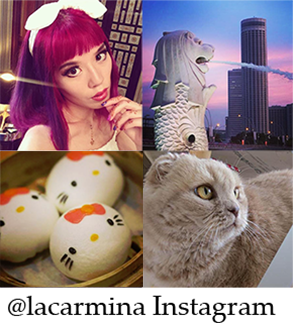 PS: You’re welcome to Share and Pin these photos, if you felt inspired! Sweet! Thanks for the photos. Did you see our video about the medina? What a place. I love Marrakech. I lived there for 8 months before moving to Bangkok. 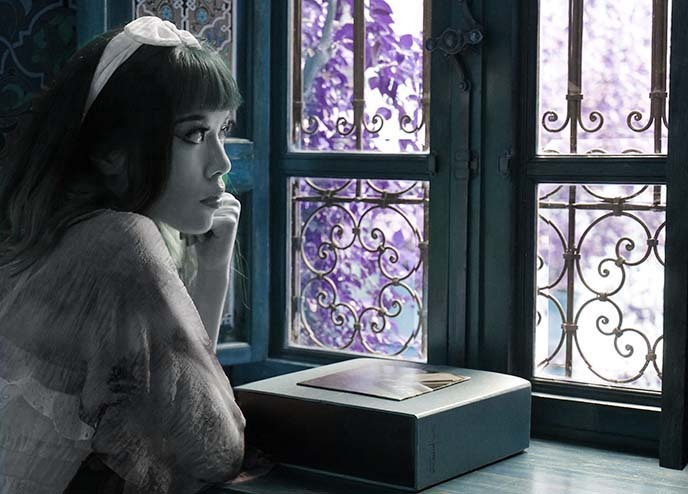 Beautiful pics, I want to stay in that hotel! Amazing! I want to go back. Wonderful dress and cool sandals. Great photography here also. Hyped! thank you for the fabulous stay!